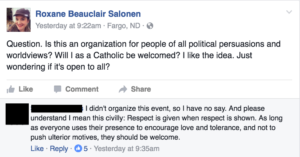 In a bewildering moment of irony, hate-speech practitioner Roxane Salonen has asked if she’d be “welcomed” at an upcoming anti-hate protest in Fargo. Somehow, the anti-hate rally piqued Roxane’s interest. But she’s not sure if it would be a “safe space” for someone with her levels of bigotry. Let’s see… considering the protest will be held on Veterans Memorial Bridge, which my sources tell me is public property, we’re going to take a shot in the dark and assume that yes, it is open to all. And no, we don’t think that attendees will be required to disclose their religious affiliation prior to participating, so being Catholic shouldn’t be a issue. We think what Salonen really wants to know is, Will this protest be just like the anti-abortion protests she’s used to attending. And to that, the answer is no. 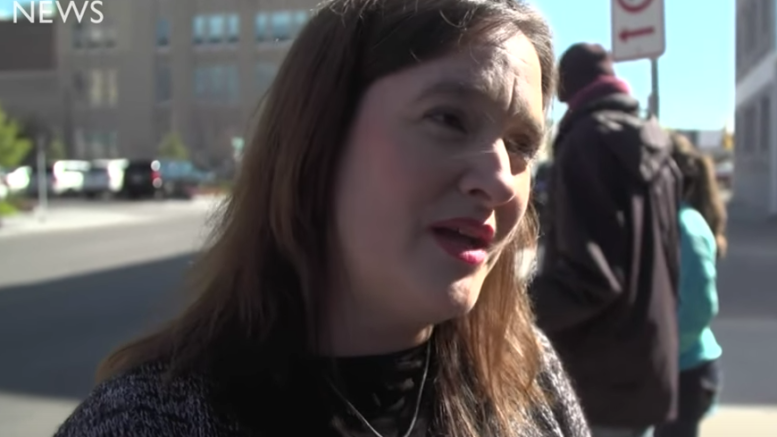 A few Facebook users questioned Salonen’s intentions, with one wondering if she’s only interested in using the protest as the basis for a “disingenuous” column. We find this scenario highly likely. Salonen feeling dehumanized? Maybe now she’ll rethink dehumanizing others for a living. Be the first to comment on "Hateful Religious Columnist Wonders if She’s “Welcome” at Rally Against Hate"